avast! 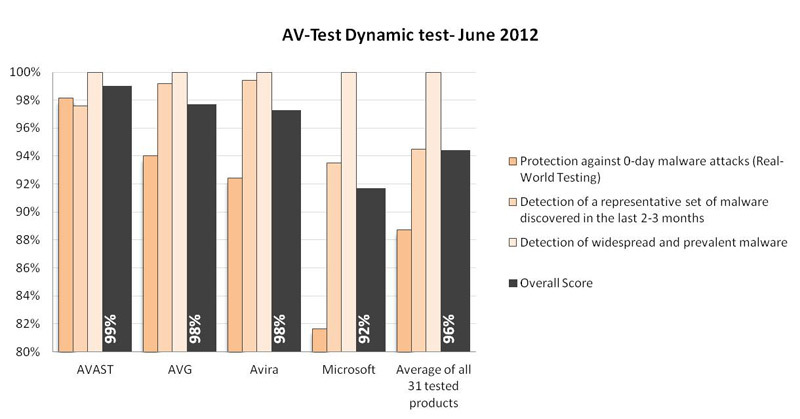 Free Antivirus outperformed multiple free and paid-for antivirus products in AV-TEST’s analysis of thirty-one consumer and business internet security products. The test, which concluded in June, included familiar names in the antivirus sector. Even a well-known paid-for ‘Internet Security 2012’ product which sells for $79.99 a year, was bested by AVAST Software’s free antivirus product. Both home-user and corporate products analyzed by AV-Test.org cover a range of metrics, including protection against ‘real-world’ zero-day malware attacks, detection of a representative set of malware discovered in the last 2-3 months, false positive rates, and scanning speed. avast! Free Antivirus detected 100% of widespread and prevalent malware (such as viruses, worms or Trojan Horses), and its cumulative score earned it the top spot for overall performance among competitors. AV-TEST uses specially developed processes to examine products in accordance with the high standards of the IT security field. The aim of the research work carried out by AV-TEST is to directly detect the latest malware, to analyze it using state-of-the-art methods and to inform consumers of the results obtained.